When you are organizing a theatrical production or play, you can sometimes have difficulty locating all the props that you need for the show. 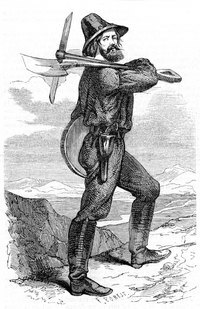 For example, if your play is about a gold miner in the Old West, you may not always be able to locate a pickax prop at a costume shop. One solution is to make your own pickax out of a few basic materials that can be found at any arts and crafts supply store. Cut out an acute triangle from cardboard with scissors to measure 4 inches wide on the short end, and 12 inches long on each of the long sides. An acute angle has angles that are all less than 90 degrees. Place the triangle horizontally along the top of a paper towel tube, and tape it in place using masking tape. Position the triangle so that the tube is in the middle of the triangle. Paint the triangle with metallic acrylic paint and allow the paint to dry for 30 minutes. This will make the triangle look like the metal on a pickax. Paint the paper towel tube with dark brown acrylic paint. This will make the tube look like a wooden handle. Allow the paint to dry for 30 minutes. Wrap colored electrical tape around the area where the triangle meets the tube in a crisscross formation. This will look like the ties on a pickax, and will make the form look like a real pickax.